This Schwaiger multi sensor combines 4 sensors in a single device. It consists of a door or window sensor and a motion, light and temperature sensor. 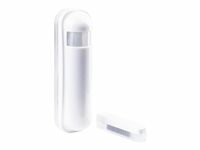 The sensor is perfect for keeping your home safe and for other automation scenarios such as controlling lights or temperatures. The product is made up of two components, the detector and a magnet. The magnet is installed on the moving part of a window or a door and the detector is put on the frame.